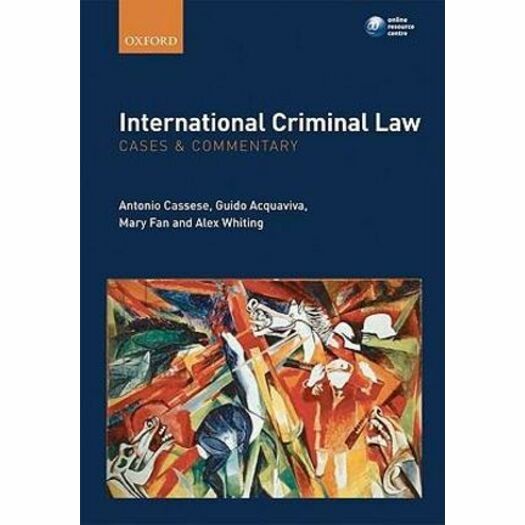 International Criminal Law: Cases and Commentary presents a concise and comprehensive explanation of the development of major areas in substantive international criminal law, through a selection of key illustrative cases from domestic and international jurisdictions. The focus is on the law related to individual criminal liability for war crimes, crimes against humanity, genocide and aggression, with specific attention paid to sources of international criminal law, fundamental principles of criminal responsibility and defences. Under the supervision of Antonio Cassese, the concisely-edited decisions presented in this casebook are accompanied by a short introduction setting out the circumstances of the case and a brief commentary on the importance of the decisions and principles illustrated, with cross-references to other relevant decisions on similar issues. At the end of each section, final remarks are added, together with thought-provoking questions and additional readings. International Criminal Law: Cases and Commentary focuses on the most relevant cases before international jurisdictions today and hard-to-find, domestic decisions that are highly relevant for the present and future development of international criminal justice. The volume is an important source for students and academics in the fields of public international law and international criminal law as well as a concise, interesting and instructive resource for practitioners, policy makers and staff of international organisations dealing with international justice. Readership: Undergraduate and postgraduate students doing modules in International Criminal Law, International Criminal Justice and International Human Rights Law. This book will also appeal to academics, practitioners, policymakers and staff of international organizations dealing with international justice.